— This article by Jerry Cates and Tammy D., first published on 29 August 2011, was last revised on 23 October 2013. © Bugsinthenews Vol. 12:08(05). Please see the attached photos and let me know who is correct. 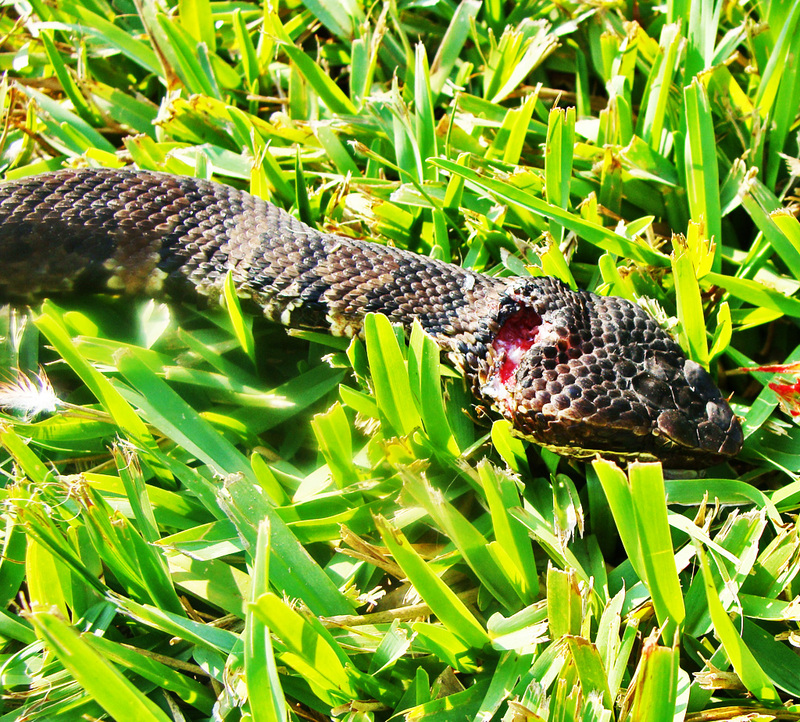 I say this is a Water Moccasin, but my husband says it’s a Copperhead. What do you think? You win. 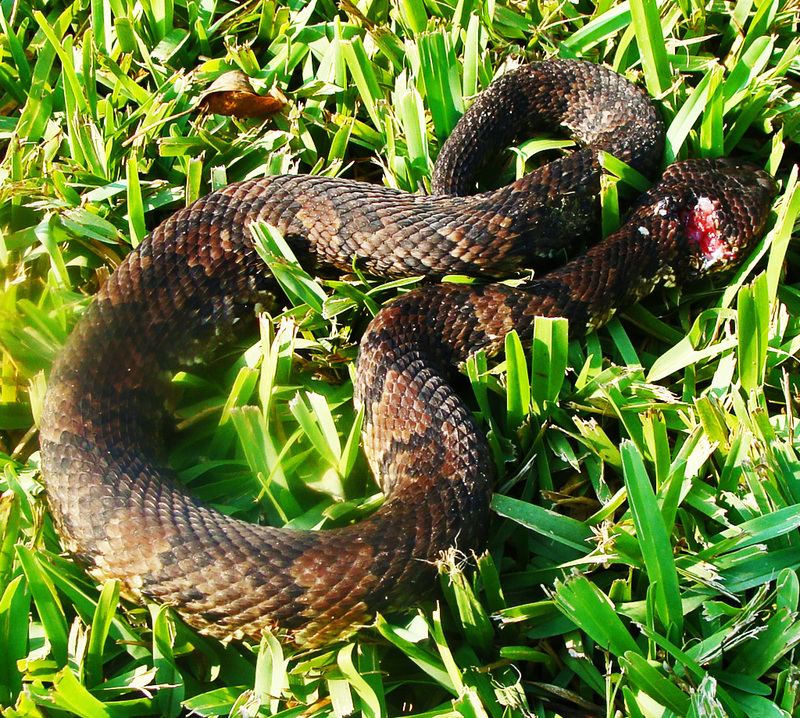 This is a western cottonmouth (Agkistrodon piscivorus leucostoma), also known as a water moccasin. The copperhead (Agkistrodon contortrix) has pinkish copper-colored markings — emphasis on the pinkish background — and the face does not have the conspicuous black eye stripe, from the eye back to the mouthline, edged in white, as shown in your specimen. If you still have this snake’s carcass, try to take some photos of the head (but be careful, as venomous snakes can still bite after being dead several hours so don’t touch the snake’s head, just position it with a stick so you can get a good closeup of the face, the nose, and the chin for me to post on the web. Then consider saving the head for me to examine more closely. I will be in your area again in about two weeks or less. If you saved the head in a plastic container, and froze it in the freezer for me to pick up, that would be great. Sometimes I ask too much of my correspondents. Plus, contrary to my usual tact, my reply did not thank Tammy profusely for her outstanding photos (she took three excellent images and sent them in this email). It is no wonder, therefore, that Tammy did not reply right away. My first thought was that the very idea of messing with that dead snake again proved too much a strain to her, and who can blame her for that? For that matter, who’d keep a dead snake’s head in their freezer for me to come by and pick up later? The answer is: Lots of people. It has been a constant source of amazement how many are willing to do such a thing. Perhaps it’s their appreciation for the importance of advancing our knowledge about snakes. 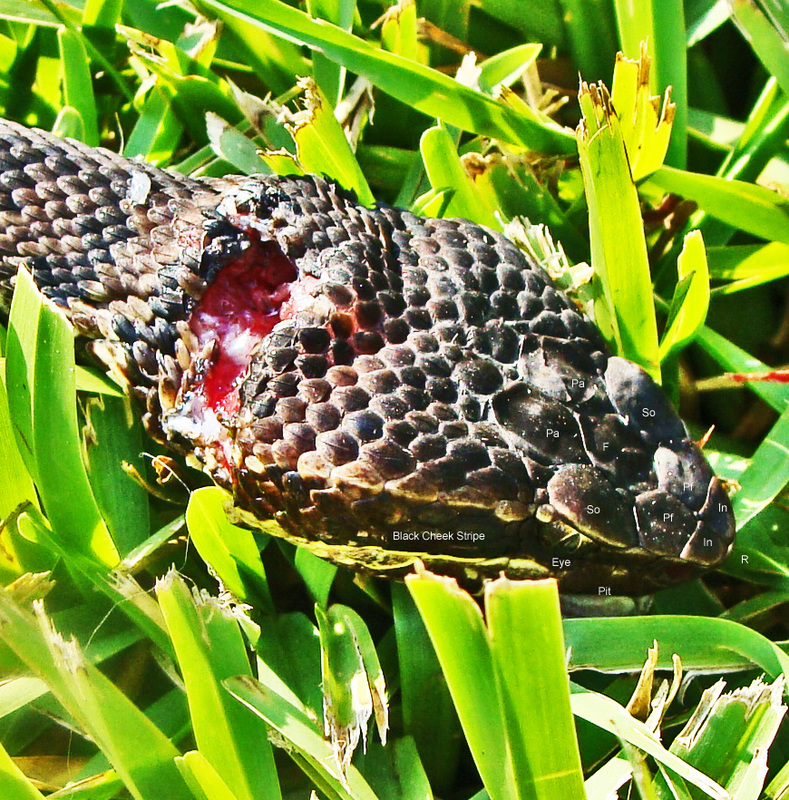 Whatever it is, most of the time — when asked for such a favor — the answer comes back “Why, sure, just let me know when you will be coming by.” But first Tammy had to get my message, within a reasonable time frame, before the snake’s carcass spoiled in the hot Texas sun. As luck would have it, she simply didn’t get it in time. Regardless, we’re still big winners here, as she sent three excellent photos of this serpent in her original email and they are posted below, in their original (though gently processed) form, with certain portions enlarged and annotated so we can learn a little about western cottonmouth anatomy by looking them over. Note: These photos may be enlarged for more detailed viewing by hovering your cursor over them and clicking. Taxonomy: Let’s start with the taxonomical history of this serpent, and, in the process, we’ll find out who first described it and why it was given the scientific name it now is known by. Class Reptilia: vertebrate animals that breathe air, lay shelled eggs (or, less often, give live birth), and have skins that are covered in scales and/or scutes. 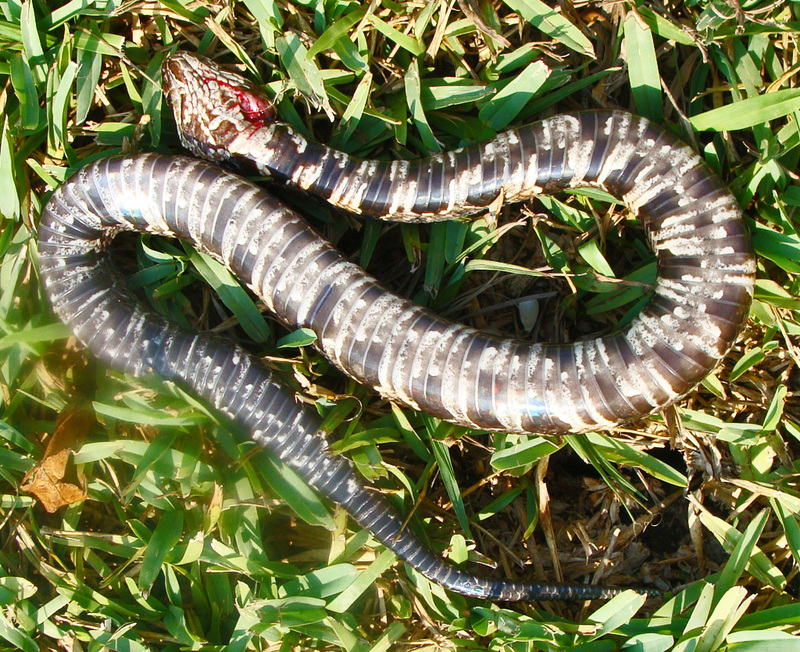 Our specimen, the western cottonmouth, is covered in weakly keeled scales, and the young are usually born alive rather than laid as shelled eggs (Werler & Dixon, 2000, p. 164). 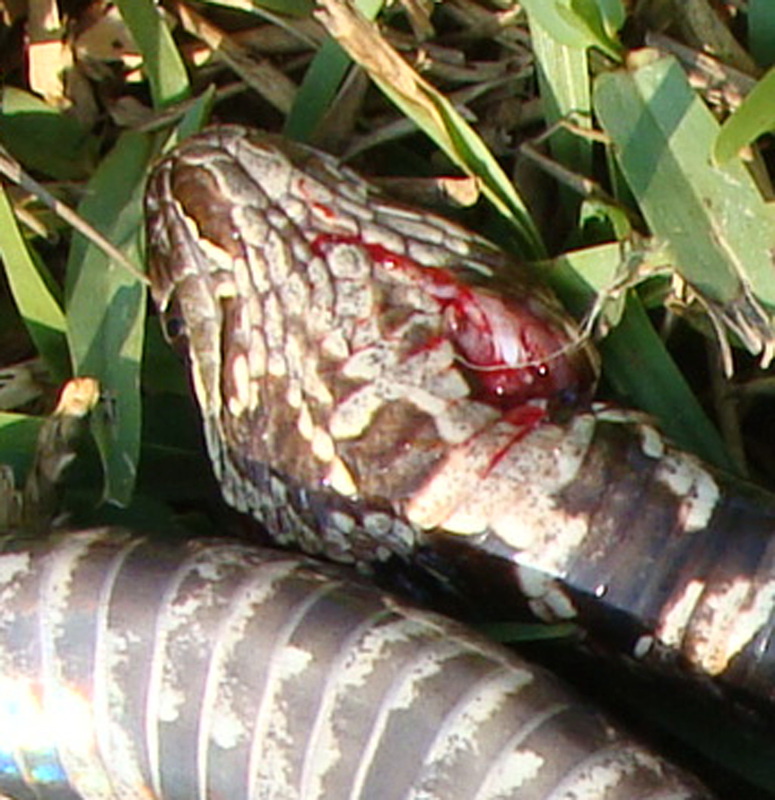 More specifically, these snakes are ovoviviparous; the eggs are fertilized in the female’s ovaries, and thereafter develop within a thin but intact leathery shell, obtaining all necessary nourishment from the yolk of the egg, and then are either born alive inside the female, or are laid just prior to birth to emerge from the eggs soon thereafter (Birchard, 1984). 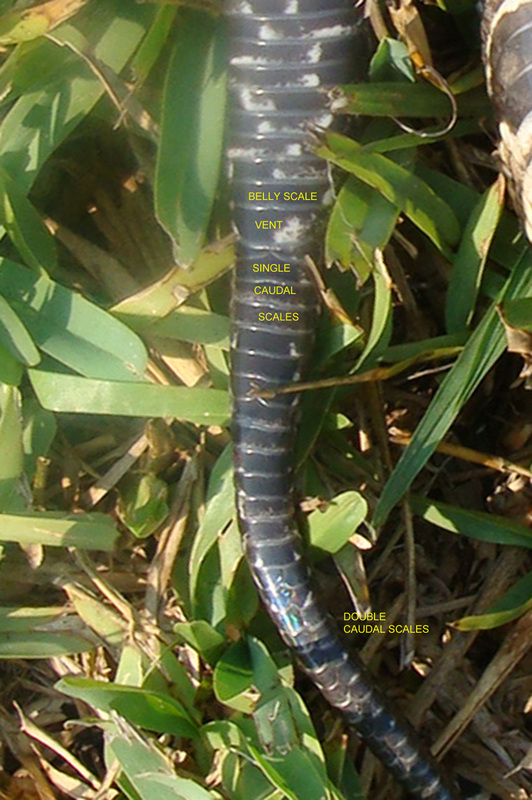 Family Viperidae (some authorities group the vipers according to several family names, while others — following a more recent convention — group all vipers under the Viperidae, and distinguish between them at the subfamily level; here we adhere to the latter taxonomical system, though good arguments can be made for the former): these include all venomous serpents with relatively long, hinged fangs that permit deep penetration and injection of venom; the fangs of the western cottonmouth are relatively large — up to 5/8th of an inch long (Tennant, 1998, p. 234) — and the venom is constituted to liquefy the tissues that absorb it; this often leads to gangrenous wounds and, on healing, gangrene-crippled fingers or toes; these are conditions that, according to some authorities can be prevented by prompt intravenous injection of antivenin (Werler & Dixon, 2000, p. 165). Hence the importance of getting to a well-equipped medical facility immediately after the bite occurs. Subfamily Crotalinae (the pit vipers; some authorities group vipers with pit organs as a separate family — the Crotalidae, alongside the Viperidae or true vipers; here we follow the more recent convention of grouping all vipers under the family Viperidae, distinguishing between the taxonomical groups within the vipers at the subfamily level, e.g., the Crotalinae, or pit vipers, and the Viperinae, or true vipers that lack pit organs): pit vipers, i.e., venomous, fanged serpents with a heat-sensing pit organ located between the eye and the nostril on either side of the head. See the location of the pit in this specimen’s head in fig. 103, above. Click on the image to enlarge it. Species Agkistrodon piscivorus: The specific name piscivorus was first described in 1789 by the French naturalist Bernard Germain de Lacépède. This was the same year that Palisot described the generic name Agkistrodon. Lacépède crafted piscivorus from the Latin words piscis (fish) + vorare (to devour), to reference the snake’s favored prey. Lacépède, like Palisot, was dogged by the French Revolution and his fierce opposition to its accompanying Reign of Terror. He found it expedient to flee Paris to escape the maw of the guillotine. It is unclear if he wrote and published his book, Histoire des qudrupedes, avipares et des serpents (1788-1789), in France or, as seems quite likely, in the United States. Methinks the latter makes the most sense, owing to his inclusion of a number of American serpents, but more research is needed to confirm or deny that presumption. Subspecies Agkistrodon piscivorus leucostoma: Though the plot continues to thicken, the third naturalist in our triumvirate — Gerald Troost — seems to have enjoyed a less adventuresome and harried life than either Palisot or Lacépède. Perhaps the fact that he followed them some 47 years later, long after the fires of the French Revolution had been banked, made the difference. Troost was a lad of 13 when Palisot and Lacépède named the genus and species of the serpent whose western subspecies it later became his lot — as a seasoned oldster of 60 — to describe. Three subspecies are recognized within the species we now call the Cottonmouth (Agkistrodon piscivorus). 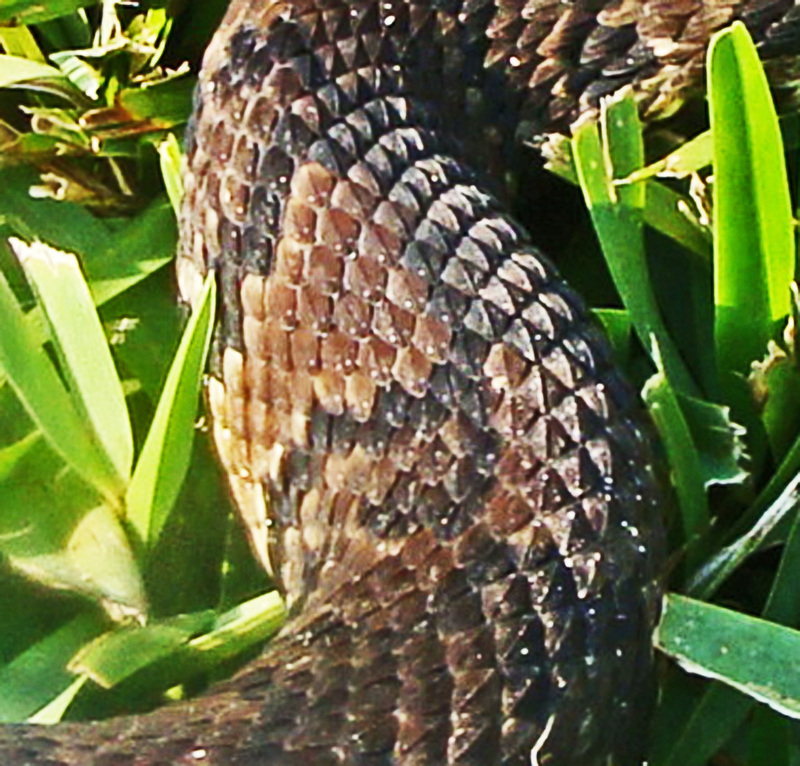 These are (1) the eastern cottonmouth (A. p. piscivorus), which is the type species described byLacépède and the largest of the three; it is found in southestern Virginia, the Atlantic Coastal Plain, and the lower Piedmont of North and South Carolina and coastal Georgia; (2) the Florida cottonmouth (A. p. conanti), a medium-sized snake found in southern Georgia and Florida; and (3) the western cottonmouth (A. p. leucostoma), the smallest of the three, found in southern Alabama, along the Gulf coast and offshore islands of that coast, to southeastern and central Texas, north to Oklahoma, Missouri, Illinois, and Indiana. 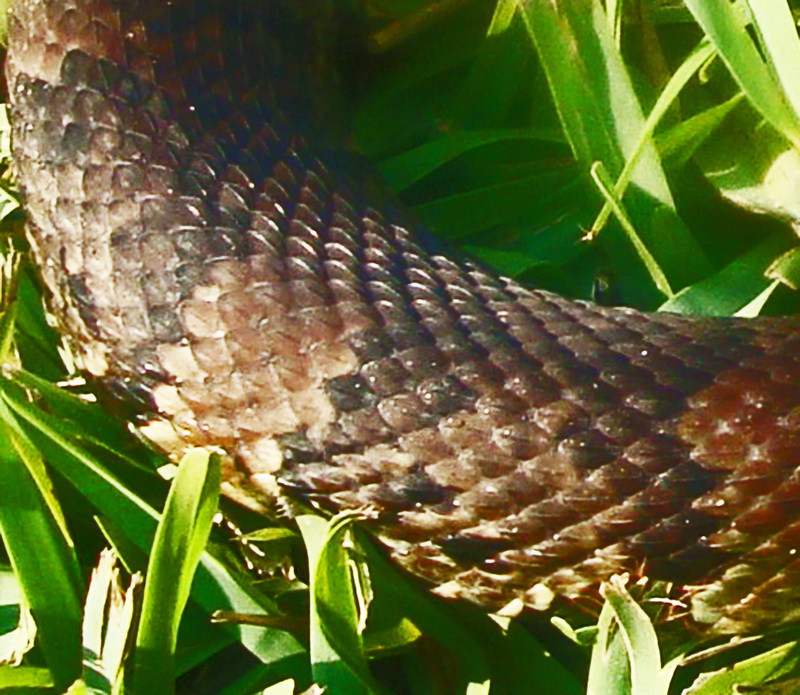 Our specimen, the western cottonmouth, was — as mentioned above — first described by Gerald Troost, in 1836. Troost, an American-Dutch naturalist (among his many other talents, which included being a medical doctor, a mineralogist, chemist, and geologist) was also the founder and first president of the Philadelphia Academy of Natural Sciences. He constructed the subspecies name, leucostoma, using the Greek words λευκος (leukos = white) + στομα (stoma = mouth) as a reference to the bright-white coloration of the interior of the snake’s oral cavity. Behavior: Tammy’s snake was found coiled up underneath a bird feeder in her yard, not far from the edge of a 5-acre wilderness area where, more than likely, lots of this snake’s cousins live. She asked if it was hunting birds, or was hoping to catch a mouse there. Bird feeders provide ample opportunity for snakes to catch both rodents and birds, but the primary attractant — for the snake — is probably the rodent feces that litter the ground under the feeder. Snakes home in on that smell. If, while there, they are able to catch a bird or two, that’s icing on the cake.